One of the most common symptoms of liver toxicity is chronic fatigue, irritability and depression. 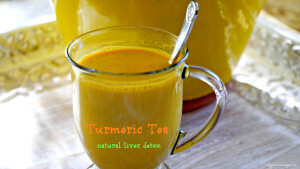 It is important to detox our liver, to reduce toxic load. A good start is eliminating processed food, eliminate alcohol, use more natural cleaning products and natural personal care products, reduce over the counter or prescription drugs, eliminate artificial sweeteners and drink plenty of filtered water. Also, you can use herbs and spices to help your liver detox naturally, and an excellent way to do this is with a tasty turmeric tea. Strain if you wish and add coconut milk.